The new padded seats in the lower sections of the arena will afford fans added comfort while they check out the Wildcats at the revamped venue. Remember when: McKale Center as it looked while under construction in September 1971. McKale Center is no spring chicken. But he’s certainly aged well, for a 41-year-old. A lot has changed since he was born Feb. 1, 1973, for the price of $8.4 million dollars. That night, Arizona played Wyoming. Coniel Norman, a freshman, scored 37 points for the Wildcats in an 87-69 win. In the four-plus decades since, Mr. McKale Center has went from a boy — with just 46 offices, five handball courts and a storage area for the drama department — to now, a man, with a whole lot more than that. A man with an $80 million plan. This is McKale Center’s midlife crisis. The Ferrari to make him feel young again. The latest McKale face-lift has the UA community buzzing, ready to see their “new” McKale. The home to great history, from Lute Olson to Sean Miller, Sean Elliott and Steve Kerr to Derrick Williams and Nick Johnson. Not to mention the “Ooh Aah Man” and longtime super-fan Phyllis Goodman. “It’s a spectacular place,” said Miller. Miller, women’s basketball coach Niya Butts and the rest of Arizona’s athletic department are reaping the benefits of this midlife crisis, and everyone that has seen McKale 2.0 has a favorite part, or parts. So, what exactly is new? And how did we get to this point? Here’s the breakdown of all you need to know about McKale Center. Technically, McKale had a “soft opening” of sorts on Sept. 5 for the volleyball team’s home opener. For the Red-Blue Game on Oct. 18, the capacity was limited by about 4,700 people, and will likely be that way again Nov. 9 for an exhibition game against Cal Poly Pomona. UA officials are confident McKale will be a full-go for the Nov. 14 regular-season opener against Mount St. Mary’s. Well, a lot. Here’s a list.Increased capacity: There are 155 new seats, bringing the overall capacity to 14,700. Lighting: It has a new, state-of-the-art LED light system, replacing the fluorescent lights McKale has long used. There will a more “spotlighted” effect, as the lights focus on the floor and the upper seating areas are darker. It looks especially good on TV. Concessions: Game-day points of sale have been doubled from 21 to 42, with stands on the east and west sides, and another “Mini Mart” on the lower level. Lines will form north to south, and will have TVs so fans waiting in line won’t miss any of the action. Restrooms: They are being expanded and redone on the southeast, northeast and northwest sides. 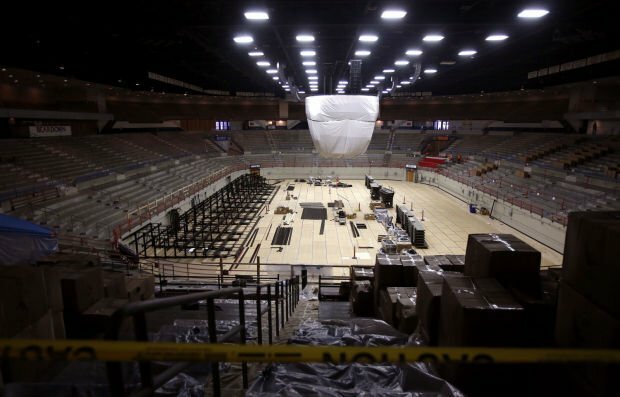 McKale’s overhaul will cost $80 million. But this is just Phase 1, with a cost of $30 million. Plus, there’s a matching program where another donor agreed to chip in up $8 million in matching funds. There are now only three entrances to the floor: A players’ tunnel under the middle of the south stands, and the two existing corner exits on the northwest and northeast sides. 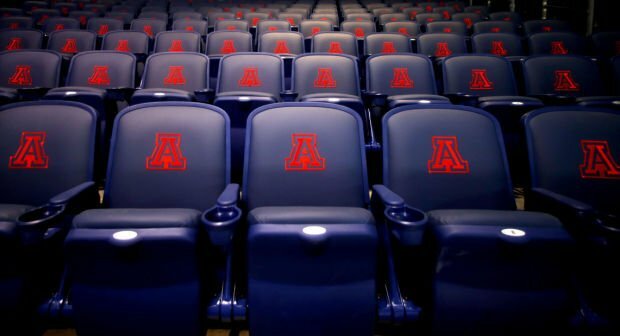 Zona Zoo, the student section, will remain at about 2,400 un-padded seats alternating in navy blue and red to make up a big block “A,” visible when the arena is empty. The men’s basketball film room is having movie theater seating installed. The walls of the men’s locker room will showcase its four Final Four teams and 10 Elite Eights. A high-definition video scoreboard, the first part of Phase I, was installed in December 2013. El Saguarito is the new Mexican food provider, replacing El Charro Café. Concession food will be the same, working with student union concessions. When the stand on the top east side is finished, “you’ll see a lot more grilling,” Mason said. Including fresh-made hamburgers. Since McKale re-opened with the first volleyball match, the women’s basketball team has added one three-star recruit for 2015, and a four-star for 2016. Attendance for volleyball has been on the rise: 3,547 fans cheered at a Sept. 24 match against ASU. Claims the UA owes him more than $100,000 for acting in bad faith.